This magazine is light-years beyond anything else that’s been sent to me since I left Colgate. The magazine should always be printed in this format. The layout is fresh, interesting, and made me want to read it. Really well done. It felt current without being trendy. Perfect. As an environmentalist, I’m tremendously disappointed that the cover of the brand-new magazine (autumn 2018) would feature a balloon release. Although this image was created via Photoshop, balloon releases are incredibly detrimental to the environment. Balloons are ingested by farm and ocean animals, and they result in litter in communities. Lastly, they create wildfire hazards by landing on power lines. In fact, many coastal communities around the country are banning balloon releases by law because of these issues. In short, there is no value to such an irresponsible and thoughtless activity as a balloon release, and I hope you will take steps to make this clear. I received my copy of the Colgate Magazine and enjoyed the new format. I particularly liked your piece about Justice Ruth Bader Ginsburg (“The A-Z on RBG”). Some time ago (before the movie), I attended a large affair at the Museum of Natural History. Most people there were there to be seen. As I was introduced to people, they spent the conversation looking for someone more important than me, with the exception of Justice Ginsburg. She spent the entire time we were together with her eyes never leaving my face. Nothing earth shattering was said, but I was impressed. It was real conversation, and I will always remember it. I was pleased to find that Julie Cohen ’86 was a Colgate graduate. I certainly enjoyed the movie. In response to “Two Hundred,” autumn 2018, #10: 1958 was a time when Syracuse University (SU) football was a powerhouse, ranked 9th in the nation. Each year, prior to the Colgate-SU game, Colgate freshmen erected a bonfire as high as their graduation year (ours was 62 feet). The operation was akin to building a house. That year, SU students attempted to infiltrate our ranks and ignite the “house” prematurely. We guarded our construction 24/7. Surreptitiously, SU students were successful in infiltrating our ranks and dropped concentrated orange dye in Taylor Lake. Indeed, the lake was SU Orange! We felt compromised. There had to be retribution. In Theta Chi, one of the brothers had his pilot’s license. Four of us drove to Norwich and rented a plane. While the SU team was scrimmaging, we flew over Archbold Stadium with ammunition. We had plastic shirt bags filled with maroon paint (not red as described in the article). We dropped the first paint bomb. Since we were flying at 100 mph, the bag dropped at an angle and landed outside the stadium. Had we been more attentive in class, we could have calculated the angle of entry to accurately hit the target. We were more accurate on subsequent passes. The team and coaching staff dispersed in panic — 300-pound linemen were setting a land speed record. After our ammo was spent, we headed back to Norwich. The self-congratulatory spirit on the return trip was palpable. Waiting for us was Dean of Students Fred Verro, arms crossed. The sight of the dean was not a good sign. Turns out, the first bag of maroon paint hit an ROTC car. The driver took the numbers off the wing. Thanks to the benevolence of Dean Verro, who recognized the intensity of the rivalry, we only received six months of social probation. Now you have the true saga of the air raid. 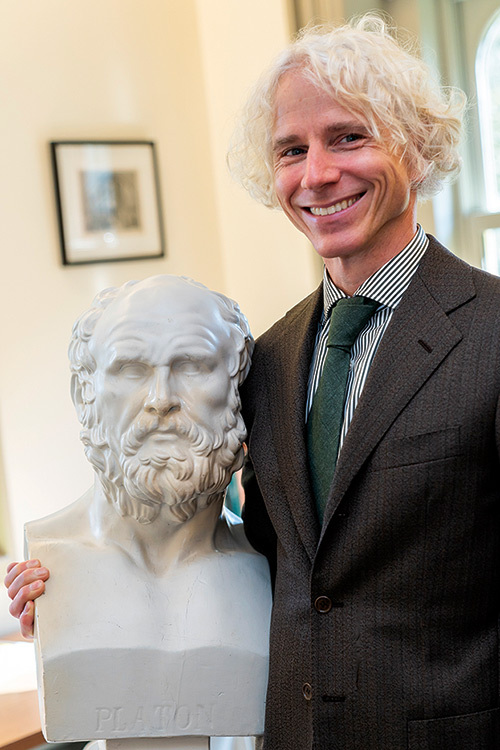 In response to “Two Hundred,” autumn 2018, #166: The bust of Plato might have survived: It is in my office! 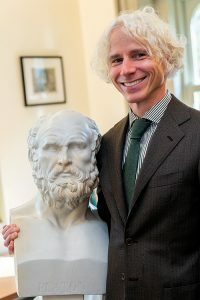 The Plato bust used to be in the old chapel, and I have absolutely no idea how it got to my office all these years later. A couple of years ago, I came back to campus after the summer and it was just sitting in my office! Bizarre. Our department was delighted to see the dinosaur egg (#19 and #86) and the fluorescent mineral exhibit (#197) among the noteworthy “200” citations. Both are on display for anyone to visit: Colgate’s dinosaur egg is in a case in the Linsley Geology Museum, and the fluorescent minerals can be viewed near the Ho Tung Visualization Lab. The egg was kept in Colgate’s vault following the 1950s prank, but donors to the Linsley Geology Museum made sure it would be on display in the Ho Science Center after the department moved there in 2007. 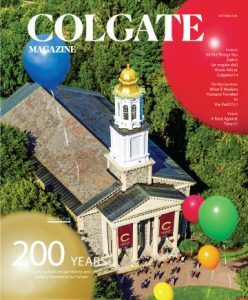 Best wishes to Colgate during its 200th year! The Spin Doctors’ “Two Princes,” fall of ’92. I was a first-year in West Stillman, and a girl who would later become a friend blasted it out of her window for everyone to enjoy. To me, that was college life, and I loved it. Fun music, shared experiences, hanging out between classes. It made the homesickness disappear. Share your story at 200.colgate.edu. 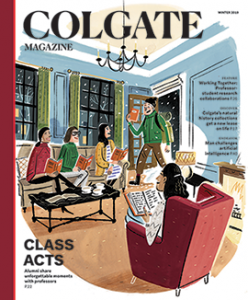 Send your letters to Colgate Magazine: magazine@colgate.edu or 13 Oak Drive, Hamilton, NY 13346. We reserve the right to decide whether a letter is acceptable for publication and to edit for accuracy, clarity, and length. Letters deemed potentially libelous or that malign a person or group will not be published. Submissions should not exceed 250 words. Please include your full name, class year, and location.